We’ve been busy around here. There’s a lot of work to be done on this place, and My Cowboy has to pace himself, but we try to do at least some little something every day just to keep moving forward on our house projects. My Cowboy re-plumbed the washing machine so now it doesn’t spew water all over the floor. He re-wired all the light fixtures in the barn to keep them from burning the barn down. Kind of important, those things! He hung some shelves for me, and I got a little more work done on my office upstairs. Saturday, I went to an all day Community Service work day with my fellow guild members in Kirksville. 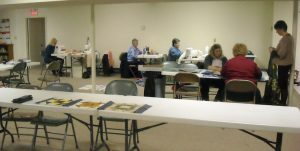 Seventeen of us worked all day . . .
. . . on quilts that will go to various charities . . .
. . . including some for veterans and children. 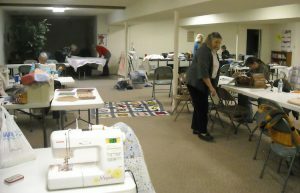 We donate year-round to various causes, so we like to keep working along so that we have a stash of quilts at the ready when someone in need gives us a holler. 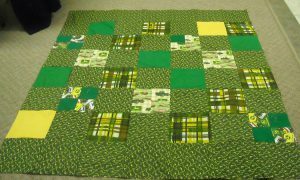 We completed several tops and several quilts in just that one day. I’m pretty proud of us! Pat and I worked on this one together. I hope she was able to finish it up after I left. I had to cut out just a bit early, because My Cowboy and I had a dinner date. The Volunteer Fire Department in our area puts on a fundraising dinner, and we wanted to attend. It was a nice sit-down, candlelit dinner at our own little table for two, complete with a tablecloth, cloth napkins, and waiters at our beck and call. The food was delicious, and we even got dessert! Our thanks go out to the Wien Fire Department for a lovely evening, only 4 miles from home! We were treated to an impromptu snow storm right after we got home Saturday night. 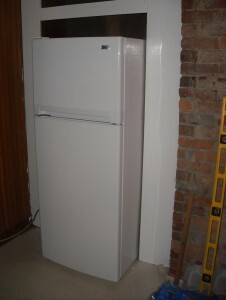 And even though it was cold on Sunday morning, the sun was shining, and we finally got a refrigerator! Woohoo! No more using the cooler on the back porch. No more having to plan the grocery list around what will fit in the cooler when we get back home. Sunday afternoon, we went to my sister’s house where she had enough snack foods set out to feed an entire county. While the Super Bowl game was being watched, I knitted. This was after I had foundered on the snacks, mind you. We had to leave before the game was over, because My Cowboy couldn’t stand watching any more of it by a certain point. Today we’re back to our regularly scheduled programming. 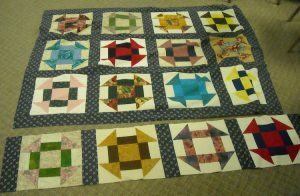 My Cowboy took the dogs with him to fix a little fence, and I’ve been quilting. So now it’s time to announce all the winners . . . 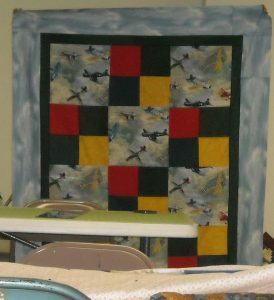 The winner of the PDF pattern for the Peace Quilt is Vicki, who thinks I should bind my Peace Quilt with black. I’m thinking that I’m either going to randomly draw from all the binding suggestions, or else combine them all into one solution. I’ll have to let you know what I decide . . .
And the winners of the January 350 Blocks Project drawings are . . .
From all those who made it to the goal: Jane B.
Congratulations, and thanks for playing along. Keep stitching and keep emailing me your block totals. Some of you have already met February’s goal, too. See? It’s not hard, is it? (I say, as I’m sadly behind . . .) I’ll go work on catching up now. You all have a great evening and a wonderful week this week! Here’s a little Civil War in Missouri trivia. There were more battles during the Civil War in Missouri than any other state. And Kirksville, MO is one of the battle sites. 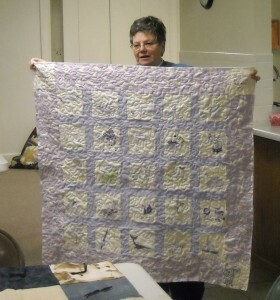 Pat did finish putting together the quilt that you two worked on and Sandy W. took it home to quilt. Hey, yippy skippy! What do you know about that? 😉 Hooray for your fridge, too. How nice that will be! 😉 Glad you are settling in a little. Yea! I love winning. Why did your cowboy not want to see the end of the game. I’m a 9er’s fan, but I thought they could maybe pull off a win until the very end. I also ate too many snacks at the Super Bowl party. You all got a lot accomplished in Kirksville! Congrats to the winners! 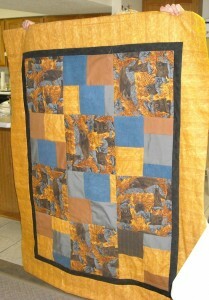 Love the charity quilts! That must be a fun day of quilting. I understand the football feeling, LOL…Can’t wait to see what happens with “Peace”.